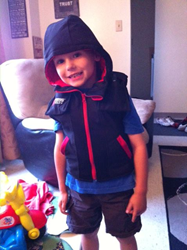 A five-year-old boy with ADHD and Sensory Processing Disorder from Northern Ontario has won a Snug Vest, which helps him calm down and has helped increase his focus at school. Antony, a five-year-old boy from Ontario, has ADHD and a Sensory Processing Disorder. His mother, Jessica, said, “He needs a lot of deep pressure and weight for him to feel good and concentrate.” As a result, he finds it hard to focus in school and stay calm through daily activities such as grocery shopping. At school, Antony wore a weighted pressure vest to help him concentrate and bring him to a safe level. However, because the weighted vest applies one constant level of pressure, he adjusted to it throughout the day. It did not provide the pressure that he needed to stay calm throughout high stress moments during the day. Antony wore this vest to stay calm throughout the day, but it made him stand out among his peers. They made fun of him for wearing a sensory product, because it looked funny and they could tell it was not “normal” clothing. Antony is now able to go shopping regularly and 5 out of 7 meltdowns have been stopped. We would like to congratulate Anthony and Jessica and the very supportive community of people behind them on winning Snug Vest’s contest. We wish Antony the best and hope that his Snug Vest will continue to help him thrive. Snug Vest is an inflatable vest that provides Deep Pressure Therapy to people with anxiety, ADHD, Autism Spectrum Disorders, Sensory Processing Disorders, or high levels of stress.